Designer tabletop grill with reversible grill plate for the ultimate grilling and frying fun: classical grill surface, smooth grill surface and a wok with a glass lid. With exact temperature adjustment and control - perfect result. It has a high-quality moulded grill plate with integrated heating elements for the highest levels of grilling comfort and energy efficiency. 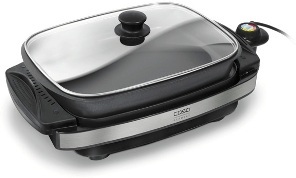 With a non-stick coating low-fat grill, from steak to pancakes - this appliance ensures that every meal will be perfect. It has a large grill surface and it is easy to clean. It has simple dial-controlled operation and it is efficient & energy-saving.